I want to entertain others. I want to enlighten others. Writers are supposed to be published. Publications will make me a better person. Publications will make me more lovable. Publications will make me famous. Publications will make me rich. If honest, most published writers will admit to more than one of these motivations. Most will admit, too, that 99% of the writers who publish never see fame or riches. Making it big as a published writer is like making it big in the NBA–or making it big as an actor. The competition is killing. And the market is fickle. Many great writers, like Franz Kafka and Emily Dickinson, never saw their work succeed. Why should you or I? Okay, maybe we’re good–maybe one of us, somewhere, is great-and maybe we’ll get lucky. Luck has a lot to do with it. If this sounds discouraging, then put publishing out of your mind, because getting published is all about rejection. For every one of the dozens of stories I’ve published, I have received about 15 or more rejections. That’s hundreds rejections. I have piles of them! This means that, even if you’re a great writer, a publisher may reject your story because it’s not the kind of story that this magazine seeks. Period. It has nothing to do with your talent or your worth as a human being. 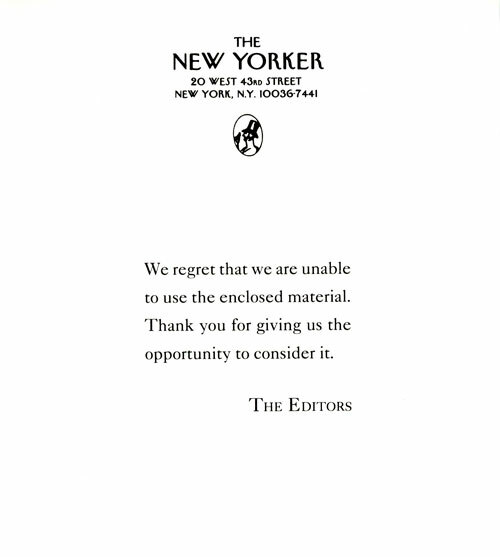 That’s why in a rejection note an editor may say, “This isn’t right for us.” And that’s why you will save yourself a lot of time, money, and aggravation if you do some research in order to find just the right magazine for your story or poem. 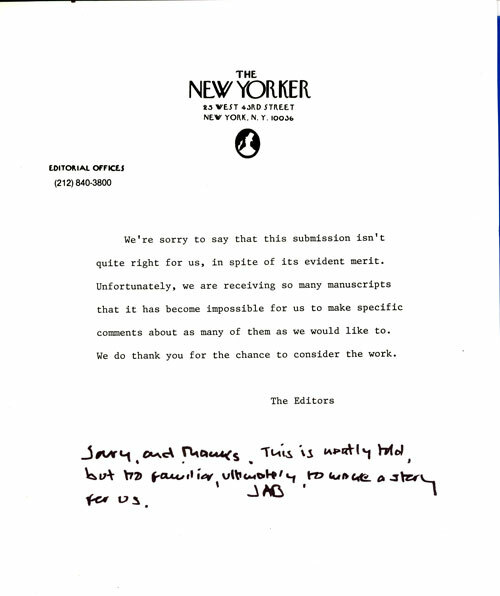 Nevertheless, no matter how experienced a writer you are, rejections hurt. I have known some very talented writers who have given up on publishing because they couldn’t stand the relentless rain of rejections. I myself have had some weeks where I’ve received a rejection — sometimes two — every day, one after the other, day after day. The hardest part of dealing with rejections is that each one may make you second-guess your work: should I revise the story? [I’ll talk about stories here, but poems, plays, and books apply.] Am I losing my touch? Will I never publish again? Less experienced writers often profit from reconsidering their work. There comes a time, however, when your craft is developed well enough so that you worry only about your story (or theme). At that point, the success of your story may simply be a matter of opinion–some readers will love it, some readers won’t. Some of the most successful fiction I’ve published was a series of six near-futuristic stories that I knew had to stay just as there were, no matter what anybody else said about them. They remain some of my favorites because they do exactly what I think they should. That’s the ideal, when we create a work we thoroughly believe in, so that rejection becomes a matter of opinion and, as a result, rejection’s sting is blunted. This is not to say we writers should be adamant or stubbornly defiant; it is to say, rather, that we should work for a firm vision of what we’re trying to accomplish. Because reading remains a very subjective undertaking, we should accept that our work will not appeal to everyone. Our challenge is to find the readers–first among our friends and colleagues, then in the world of publishing–who think our work is worth their time. 1) Study the magazine you’d like to appear in. Is your work in keeping with the kind of thing that magazine likes to publish? If so, choose your best story or best 2-3 poems to submit. Never submit both a story and a poem or poems. You also owe it to yourself to check out print versions of these magazines at your local book store (remember those?). If you are not buying, subscribing, or reading any literary magazines, you should ask yourself what you’re doing: you want these magazines to publish you but you don’t want to read or support them yourself? 2) As of this writing, most magazines use an online submission manager to take in submissions. Submission managers are databased programs that will upload the story, poem, or essay you’re submitting and track your submission through the whole process. Submittable is a good example of a submissions manager. 3) To make a submission, all you do is pay a modest submission’s fee (about $5), then upload your file. Some magazines offer you space to write a brief note/letter to the editors. In fact, some magazines require that you fill in this box. Enclosed, please find my story, “A Plum Day,” submitted for your consideration. My stories have appeared in such magazines as Rocket Ready, Stone’s Throw, and Crooked Fence. Last year my story, “Not Again,” won the Apprentice Prize, awarded by Pigeon Peck Press. Should you find this story unsuitable for your magazine, your comments will be greatly appreciated. Notice that you do not waste the editor’s time by summarizing your submission, nor do you attempt to interpret the work or tout its thematic value. Just keep the letter as short and professional as possible–to show that you are businesslike and will not fire-bomb the publisher if he/she does not accept your work. 3) There are still many magazines (maybe 1/3) that accept submissions only the old fashioned way: through the mail. If you want the ms. back, then include enough postage on your big (self-addressed) envelope for the return trip. 4) Place the ms. (one story or 2-3 poems) in a large manilla envelope with the submission letter and the SASE. 5) What about multiple submissions? Many writers submit the same piece to more than one magazine at the same time. Is that okay? Some magazines don’t allow it and they will say so in their submission guidelines. Be sure to review these guidelines for each magazine you submit to. Multiple submissions really clog the system, slowing down response time from editors Unless you’re in the publish-or-perish position like writers who work in universities, you have to ask yourself why you’re in a rush to submit the same piece to many magazines at the same time. 6) Another thing to check in the submission guidelines is whether or not the magazine takes “unsolicited” manuscripts. “Unsolicited” means “un-asked-for.” Some magazines are such big deals, they don’t take unsolicited submissions. Instead, they ask for submissions from writers they know (usually famous writers). 7) It now takes magazines about 4-6 months to respond to submissions. Some magazines take a year. A few magazines never get back to you if they don’t want your piece. I know, I know, the wait can be maddening. It doesn’t seem fair. But, let’s be honest: we’re part of the problem, sending so many things to so many magazines. Most magazines are woefully underfunded and understaffed. So, let’s give them some support: subscribe or donate to the magazine you would have publish you. 8) Chances are, you will receive a rejection note. I’m not being negative here, just realistic. Probability alone dictates that our chances of publication are slim, even if we are quite accomplished. Even small literary magazines get as many as 1,000 submissions of poetry or fiction in a single month. Think about that. Dear Writer: We regret to inform you that your submission is not the right fit for our magazine. Thank you for giving us the opportunity to consider it. Dear Writer: We’re sorry to say that this submission isn’t quite right for us, in spite of its evident merit. We encourage you to submit again. Dear Ron: We’re sorry to say that this submission isn’t quite right for us, but we’d like to see more of your work. If the magazine really likes your piece but it’s not quite right, they might ask for a revision. But know this: most magazines don’t have time for revisions. If they like your piece enough, they will accept it. Then an editor will work with you to tweak it, if it needs tweaking. 9) Perseverance pays. It takes 2-5 years of consistent submissions to break into the publishing scene. I average about 10-15 rejections for every story I’ve published and so I now have hundreds of rejection slips–bags and bags of them. If you insist on making your work public, then you must submit yourself to the possibility of rejection. Don’t take it personally. 10) Pay? There is little or no pay involved in getting published in magazines, unless you’ve sold a story to one of the really big magazines like THE NEW YORKER. For most literary magazines, there may be payment of, say, $50 and a couple of free issues. That’s the scene. NEVER pay anybody to publish your work. If the magazine/editor asks for a fee (other than a modest submission fee), then it is not a respectable enterprise and certainly not a worthy showcase for your work. Writers pay money only for contest entrance fees (and online submissions). Of the approximately 800,000 manuscripts considered by major American publishers every year (not to be confused with the many more that are submitted), only about 1 in 10 get accepted. Of those, only a handful make it to publication. And yet we are publishing more books than ever before: approximately 170,000 a year. Very few writers make a living publishing books. Yes, Tom Clancy makes $66 million a year and Stephen King $64 million. There is money to be made. But, unlike other businesses, where you can study clear demands and market issues, publishing is notoriously fickle. Few publishers can figure out what will or won’t sell; and many have gone bankrupt attempting to pursue the next trend or fad. The submission process for book publishing is different than for magazines in one major way: a writer almost always queries before sending any writing to a publishing house. Again, it’s important to look at the publisher’s submission guidelines. Usually, the writer sends a one-page query letter that “pitches” the book. The pitch contains a brief and catchy synopsis, a comparison to other books that are like it (and how they did in the marketplace), and an overview of the target audience. This query letter may be attached to a sample chapter from the book in question. If the editor is interested in the material, he or she will contact the writer. Usually, if the writer doesn’t hear from the editor in a month or two, nothing is going to happen. Most publishers will tell you on their websites whether or not they look at unsolicited (un-agented) writing. Most of the really big publishers, like Random House, won’t look at writing sent to them by the writer herself. The manuscript has to be submitted by an agent. The agent is acting as the gate-keeper because the agent (supposedly) won’t represent anything that isn’t of the highest standards. That said, there are many publishers who will consider un-agented writers as long as those writers follow the publisher’s submission guidelines. The increasing difficult of getting published has compelled many writers, both new and experienced, to self-publish their writing. See “All About Self-Publishing” for more on this. Here are some primary terms and features of the publishing industry. Serial rights: these are reprint rights. Authors often sell these to the publishers, who may make money on reprinting the work in magazines and other forms. Subsidiary rights: authors sell the subsidiary rights for such spin-off products as movies, videos, dolls, games, etc. Remainders: these are the books that did not sell from the publisher’s first printing. These unsold books are sent to wholesalers who, in turn, sell them at just-above cost to bookstores-and the bookstores sell them to the public at a deep discount, usually half the cover price. Easily, 90% of novels published this year will be on the book store remainder tables next year. Once the book is remainder, it is out of print, meaning that the publisher is no longer carrying that title on its “list” or that title in this form (usually hardback). List: is short for “publication list,” the current catalogue of books a publisher is printing and selling. Best sellers: This term, “best seller,” is similar to “gold record’ in the recording industry. It means the book sold a lot, though not necessarily a million copies (like a gold record). Different newspaper and magazines have different criteria for ranking bestsellers; sometimes it’s simply the number of books ordered by stores (thought not yet sold). The most famous bestseller list is published by The New York Time’s Book Review. Blockbusters: as in movies, some books are a huge success. The “Harry Potter” series, for example, has sold 164 million copies worldwide by May 02. That’s a blockbuster. Major house: these are the largest publishers, such a Viking, Random House, and St. Martins, and are best known to the general public. More specifically, they are major publishers of “trade” publications, which are books sold to the general public.They sign big-name authors, like John Grisham, and market the biggest selling books, as well as others. Since the 1970s major houses have been consolidated increasingly by corporations (this is a trend that bookstores have mirrored since the 1990s).. Largest trade book publisher currently is Random House, for example, with $4.2 billion in sales (as of 2000). It has consolidated several other publishers and now consists of Random House Trade, Knopf (a prestigious literary publisher), Ballantine, Bantam, Random House Children’s, and Fodor’s Travel. Small press: these are independent publishers (that is, they are not affiliated with large corporations the way major houses are); they usually deal with “literary” fiction and nonfiction and, as a result, they are often considered “high brow”. They print much a smaller number of books than the major houses and have a much smaller distribution. Vanity press: these are presses that charge a fee to print your book. They don’t really have a submission requirement. Hence, “vanity” refers to these writers who must pay to have their work published because they can’t get regular publishers to take their work. Many writers have defied the stigma attached to self-published books and gone on to win a large readership–which sometimes attracts a major publisher who will pick up the book. Government press: Government Printing office, established in 1895 to print all documents written by government agencies, is the largest publisher in the world. It prints such things as reports by the Surgeon General, pamphlets on how to prepare your income taxes, childcare guides, house-buying guides, etc. * Professional: specialty books for specific professions, such as engineering, medicine, etc. The concept of a customer walking into a store to buy a book is relatively new in our society. Book stores as we know them have been around about 200 years. Considering that writing has been around for 2,000 years, this revelation may strike you as stunning. If there were no book stores until recently (historically speaking), how was there a market for writing? More specifically, how did writers make a living? In order to answer this question, we must answer another first: when did people start selling and buying books? If we go back to the earliest forms of reading material — scrolls and codices — we recall that these existed in a predominately oral culture. We may locate the beginnings of the book trade in the Roman empire. Early on in this era, you could hire a scribe to transcribe the speech of an orator. A bit later, there developed a class of tradesmen called bibliopolae (“book people”), who acted as middlemen between the transcribers and the public. There is no indication that the authors (the orators who delivered the popular speeches) ever got compensation for the sale of these transcriptions. It became fashionable in the late Roman period (200-400 AD) for the wealthy to have their own libraries (of scrolls, codices, tablets, and other forms). This set a standard of extravagance and learning that the wealthy would be emulated in all Western societies for centuries to come. As for the authors themselves, they were not paid professionals. Paid writers were employed only by governments and the wealthy for record keeping and other official duties. Writing works for entertainment and education was not a career but, rather, an avocation — a hobby or passion that the literate and the enlightened pursued in their spare time. Who had spare time? Mostly the rich. Until about 1750, most writers of note were of the privileged class. Literacy, after all, was a product of education. And writing well was the product of practice and leisure. Elizabethan (1558-1603) writers of note — such as Christopher Marlowe, Francis Bacon, Sir Thomas Browne, Andrew Marvel, and John Donne — were men of privilege and means. William Shakespeare and, to some extent, Ben Jonson were exceptions and, as such, foreshadowed the writer of the Modern Age (1750-1950): independent, full-time artists. Now, we call such artists “professionals” because writing is their sole profession. And they get paid for this. Right Honorable, I know not how I shall offend [you] in dedicating my unpolished lines to your Lordship, nor how the world will censure me for choosing so strong a prop to support so weak a burden. Only if your Honor seems but pleased [will] I account myself highly praised, and vow to take advantage of all idle hours, till I have honored you with some graver [worthier] labor. 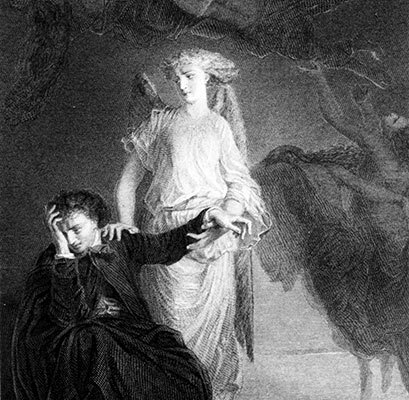 But if the first heir of my invention prove deformed [if my writing fails], I shall be sorry it had so noble a godfather: and [I will] never after cultivate so barren a land for fear it yield me still so bad a harvest. I leave it to your Honorable survey [judgment], and your Honor to your heart’s content, which I wish may always answer your every wish, and the world’s hopeful expectation. Patronage goes back at least to the days of ancient Greece, when a renowned writer (orator) would very likely be attached to the household of an aristocrat. Patronage was always an iffy proposition that demanded the writer curry the patron’s favor at every turn. 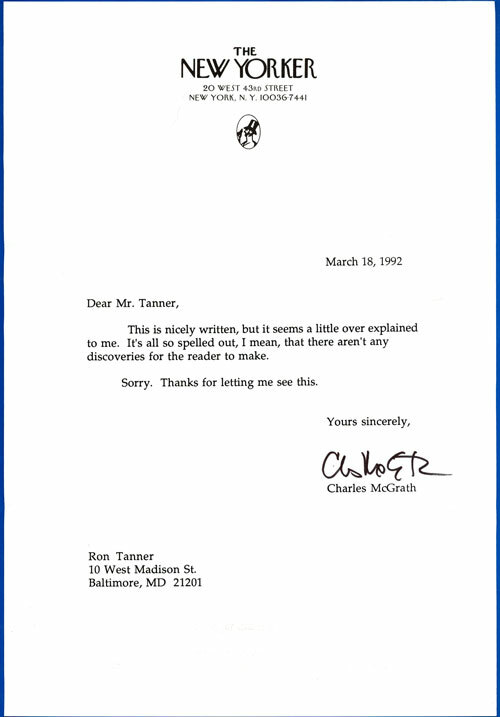 Often this did not turn out well, either because the writer’s ego was as big as the patron’s or the patron was simply hard to please. The inevitable fallout meant that the writer would have to seek another patron. Some writers were scrambling from castle to castel, court to court, every year or so. Is not a patron … one who looks with unconcern on a man struggling for life in the water, and when he has reached ground encumbers him with help? Johnson struggled mightily for success — and patronage — but spent most of his adult life writing for small sums at a time when the readership had grown large enough to support independent publications, especially newspapers and journals. He was the first of the independent writers, though late in life he accepted a government pension, awarded him for his achievements in writing. Tbe pension was one of many later forms of patronage. As the influence of royalty (and those attached to royalty) waned, governments filled the patronage void. The plight of the unemployed writer, and indeed anyone who could qualify as a writer such as a lawyer, a teacher, or a librarian, during the early years of the Depression, was of concern not only to the Roosevelt Administration, but also to writers’ organizations and persons of liberal and academic persuasions. It was felt, generally, that the New Deal could come up with more appropriate work situations for this group other than blue collar jobs on construction projects. . . . The outcome . . . was a project for all the “arts,” . . . . The Writers’ Project, later characterized by some as the federal government’s attempt to “democratize American culture,” was approved for federal monies in June, 1935. . . . After 1939, emasculated, the Project sputtered along on monies funded to the states, closing completely one year or so after America’s entry into World War II. These awards are few and hard to come by and hardly constitute the kind of support that can sustain a writer for an extended period of time. But they are remnants of a long-established tradition of offering support to writers. The over-arching assumption of patronage is that writers (and other artists) must be supported by the powers-that-be (government, aristocracy, church) because a thriving society needs thriving arts. In recent years, social-conservatives in the U.S. have challenged this notion by attempting to eradicate all government-sponsored support of the arts. Advocates of “small government,” these critics contend that free enterprise should determine what arts will or won’t survive. This position misses the point that if there existed only the kind of writing that sold well, then there would be very little writing (and very little variety of writing) on the shelves of bookstores. We’ll discuss these issues in more depth in our chapter about literary culture. The novel was a new art form that rose to popularity in the late 1700s. Its phenomenal success, especially among women, made preachers, parents, and other authorities wring their hands in worry and voice their disapproval. Wrote one critic in 1848: Novels “have done more than all other causes combined to corrupt our taste, and degrade our literature.” (We’ll discuss this issue in our chapter on literary culture.) The success of the novel made it possible for writers to leave the constricting bonds of patronage and make a living writing whatever the public was willing to buy. This new freedom raised issues about the purpose of literature because, until this time, many considered reading to be reserved primarily for the Bible and other religious works. Some critics complained that writers were now pursuing money, not meaning or morality. The profession of writer came into full flower in the last decades of the 1800s and the first decades of the 1900s. Writers started hiring agents to represent them as early as 1875. Agents underscored the business element of what had, for centuries, seemed only a cultural undertaking. It is likely that this new emphasis on the business of writing — specifically the pay to writers — encouraged publishers to sell books more aggressively. 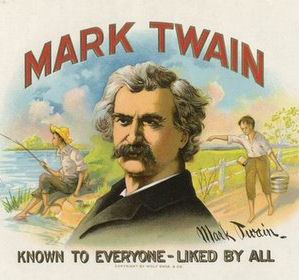 Advertising of books became common by 1900. Generally, writers were held in high esteem and more than a few, like Edith Wharton and Ernest Hemingway, enjoyed celebrity status. Until about 1960, writers in the U.S. could make a living writing full time. For most, it was a modest living. Publishers did not give out large advances, but magazines paid well for stories and articles, as did other print media. The rise of the paperback helped build the income of writers by selling cheap books in large numbers. Those writers who did well in the 1950s and 1960s — like James Michener, Kurt Vonnegut, Jr., and Mary McCarthy — often had paperback sales to thank for it. In selling books, not much was demanded of writers. Typically, the writer’s book would come out in hardback. Then the writer would make some appearances to read in public (do a “book tour”) and sign copies of the book. The writer might give a few interviews. And that was it. When the paperback edition was released, the writer wasn’t expected to do much about it. Book sales depended on a) book reviews, b) booksellers, and c) advertising. The 1970s and ’80s saw the rise of the “blockbuster” and the million-dollar advance. Some complained that the publishing industry had gone Hollywood, as literary agents and editors chased after a grand-slam winner. 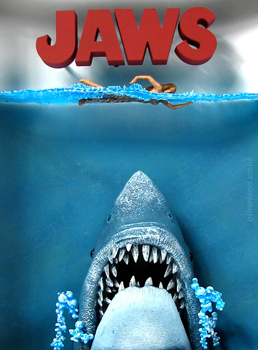 In fact, the success of books-turned-movies — such as The Godfather (published 1969), Carrie (Stephen King’s first novel, published in 1974), and Jaws (published in 1974) — seemed to beckon writers to pursue the dream of cashing in big with a movie deal. It was a temptation because one good deal could set you up for life. The result of this chase after the next blockbuster was that publishers sometimes got into bidding wars for a book. The savvy agent would pitch the hot book to, say, three of the biggest publishers and the publishers, in turn, would get nervous that they might lose out of obtaining the next Big Thing. Paying seven figures for a book was a terrible gamble and, often as not, the publisher lost out because nobody could predict the public’s taste. Worse, a heavy outlay of cash for a single book would deprive publishers of funds to obtain and promote other books. Worst of all, after a publisher blew its wad on one or two would-be blockbusters, there was no money left to keep other writers in business. The 1990s saw vertical integration of the publishing industry as large corporations gobbled up smaller publishing houses to create mega-publishers. Book stores lost a large portion of their business to monster book stores like Barnes & Noble and big-box stores like Walmart. And new media — video games especially — further reduced the potential readership. According to one publisher/editor who would know, there are now only about 50 writers in the U.S. who make their living exclusively by writing books. Nowadays, a writer who is a professional must make a living doing other things. Since 1950, for example, hundreds of poets and novelists have become teachers. Many writers make a living as editors, technical writers, MDs, bankers, lawyers (Scott Turow is a notable example, though he is one of the 50 who don’t have to work another job), and so on. As this list suggest, the burden of book selling now sits heavily on the writer’s shoulders. New media complicates the writer’s life because it’s time-consuming to learn and manage. There were sellers of writing very early on — the freelancers who transcribed speeches or things already in print. Between the fall of the Roman empire (circa 350 AD) and the start of the print era (circa 1450), book selling grew up around universities. The twelfth century (1100s) seems to be the time at which this happened in significant numbers. These sellers were called (in Latin) stationarii, for the the stalls or stations they occupied in the town square. From this word we derived “stationer,” a term that we attached eventually to sellers of paper. The stationers’ primary business was loaning books to students for a fee, since students could not afford to buy books. Usuallly the university controlled the printing, price, and even the size of books the stationers could sell. These stationers were licensed or “sworn” and had a monopoly on the sale of books. Still, there were unlicensed sellers who gave them a hard time in the market. The stationers also sold paper (parchment) and some even employed scribes to copy books. In the age of print, the printer himself was publisher and bookseller and sometimes even the writer. Benjamin Franklin (1706-90) is the American example of the one-man shop: he did it all. His Poor Richard’s Almanac was a perennial best-seller. He was so successful, he was able to take an early retirement, at age 42. As a man of learning, a skilled craftsman, and an excellent writer, he embodied the most illustrious traits of the accomplished printer, traits that were modeled by his predecessors, such as William Caxton (1420-92) in England and Christophe Platin (1520-89) in the Netherlands. By 1800, there was a clear divide between printer and publisher. Printers sometimes acted as book wholesellers when they took on a project themselves but, more usually, they were contracted by a publisher. The publisher acquired the work from an author, edited the manuscript, paid to have it printed and sewn (but not bound), then marketed the book. Before 1800, the common practice was for publishers to employ agents who would to solicit subscribers. A publisher would print a sample copy or, more usually, an excerpt, which the agent would show to prospective subscribers. If the agent gathered enough subscriptions, then the publisher would proceed with production. History tells us that the first bookseller/publisher to contract an author for publication was John Otto, in Germany in 1516. Book stalls and shops did indeed exist before 1800 but they carried a) old (second-hand) books, b) remaindered books (more on this shortly), and c) perhaps samples of books to be produced by subscription. In fact, it was more typical that books were sold in general merchandise stores, next to such items as medicines and bolts of cloth. To give you an idea of how few books were being produced, consider this: in the U.S., from 1830 to 1840, there were only about 100 books printed each year. By 1850, that number had risen to 1,000. The U.S. now publishes more than one million books a year. 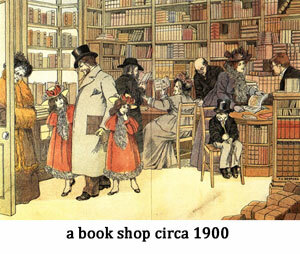 A book shop in the 1800s, then, would have been a modest affair. The book shop we have come to romanticize — cozy and thoroughly book-cluttered, with shelves to the ceiling — was a product of the late nineteenth and early twentieth century. Book Fairs: as early as the 1500s, Germany hosted an international book fair that brought printers/publishers from other countries to negotiate the trade and sale of their books. The biggest book fair in the world is still held in Frankfort, Germany, every year. Nowadays, it is the place to negotiate international sales of books on the wholesale market and draws over 300,000 attendees and represents more that 400,000 new books each year. The largest book fair in the U.S. occurs annually in Miami, Florida. 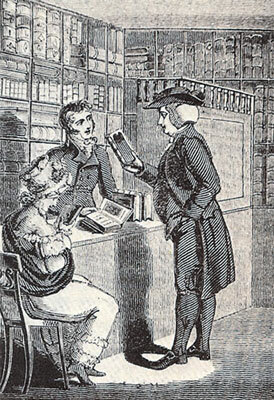 The Reps: as early as the 1600s, publishers/printers hired salesmen to represent their books at book fairs. Nowadays, every sizable publisher has its own regional reps. to visit bookstores to convince the book store owners to stock the publisher’s books. Publishers of modest size can’t afford to staff their own dedicated reps. and so must hire reps. who sell for many publishers. The challenge of this arrangement is that the hired rep. must have a balanced approach at every store in order to represent fairly the many publishers that have hired him/her. The catalogue: every publisher prints a catalogue of its most recents books. For larger publishers, these catalogues of new books may come out every season. The catalogues help the reps sell the books. It remains to be see, in the age of the internet, if catalogues — which are expensive, glossy brochures — remain an effective selling tool. As it is, all publishers maintain online catalogues to supplement their websites. In fact, some publisher’s websites are just that: a replication of their catalogue. The net price principle: by 1900, after various attempts to stabilize book pricing in the prior century, booksellers agreed to the “net price principle,” which stipulated that no matter how cheaply a seller had obtained a particular book, that seller would not sell the book to the public under the “net published price” determined by the publisher. This agreement helped discourage the practice of selling some books as loss leaders that vastly undercut the competition. See discussion about Amazon regarding this issue. National Copyright: the U.S. enacted its first copyright law in 1790 as part of the Constitution — which tells you something about how important the Founding Fathers thought this issue. See below for an overview. International Copyright: before 1885, U.S. booksellers and publishers enjoyed great success by pirating books from England. Their agents would send them the latest English publications and, shortly thereafter, the pirated version would appear on the shelves of American shops. The international copyright agreement (administered by the Berne Convention) discouraged this practice, but the U.S. did not enter officially into this agreement until 1955. See below for more on copyright. Standard Book Number system has been in place to track books in print. During the nineteeth century there developed in the U.K. and the U.S. pioneering efforts to systemize and cumulate the catalogs of publishers’ output, to the benefit of booksellers, wholesalers and librarians. The current manifestations of this development are to be found in “Whitaker’s Books in Print” in the U.K., R. R. Bowker’s “Books in Print” in the U.S. and Bowker’s “Global Books in Print on Disc” which combines the world’s top six English-language book databases on a monthly CD-ROM disc–an international bibliography which not only profiles all titles currently in print in the English-language market, but also links each of them with their publisher. The work that led to these great current bibliographies of English-language publishing was based at least partly on the premise that maintaining a smooth flow of accurate information about the various aspects of the publishing industry helps to keep this industry healthy. The development of and adherence to standards has always been crucial to creating and maintaining this flow of information. This statement was true for the Amherst College librarian Melvil Dewey. It was also true for David Whitaker and Emery Koltay when they introduced and implemented what is probably the most important standard of all, the ISBN. What would the modern computerized publishing industry look like if we did not have the ISBN to identify each iteration of the titles actively in circulation? This question becomes even more significant when you place it in the perspective of 50,000 new products each year – which is the (rather amazing) output of the U.S. publishing industry over the last few years. This characteristic of the publishing industry, that each new title, new edition, new binding, is treated as a separate new product is one of the major obstacles to unique and meaningful product data transmission within the publishing industry. It is also one of the major reasons that we must set up standards such as the ISBN and the SAN for our systems and comply with them. Distribution: Distribution means that there are a sizable number of books in conveniently located warehouses around the country. This enables bookstores in every region to order, then receive books at short notice. Getting a book to the store is called “order fulfillment.” Quick order fulfillment is crucial for all the obvious reasons. sSince no publisher can afford to distribute books for itself, it contracts out its distribution to firms like Ingram and Baker & Taylor. Discounts to booksellers: Publishers offer a discount of 40-50% to booksellers and wholesellers. Returns: booksellers are allowed to return unsold books to the publisher within 90 days for a full refund. But nowadays booksellers don’t like to hold onto much stock, which ties up their cash, and so they may buy only a few copies of any given book, then rely on the distributors to get the book to them fast if they need more. Consignment: Many bookstores will stock a book only on consignment, meaning that the publisher sends them the book but gets no cash for it unless it sells. Remainders: these are the unsold books returned to the publisher. The publisher sells these at a loss to wholesellers who, in turn, sell the books at deep discounts in retail warehouse outlets (you’ve probably been to these). Nowadays, many book stores have a remainders table, where you can pick up a nearly new book for just a few dollars. If the publisher doesn’t sell its remainders, these books will be pulped — recycled. American Booksellers Association: This is one of several organizations that help pool resources and networks to help booksellers. Indiebound is for independents (distinct from franchises like Barnes and Noble). Truth is, nobody cares about your writing or my writing. That means nobody’s going to steal it. Sure, it’s valuable to you or me — the writer — but, from a money-making standpoint, it would be the longest of longshots for a thief. In other words: if you want to make money from stealing, you’re not going to steal writing. Do you think somebody may steal your idea? It could happen. In fact, it does happen in Hollywood often enough that it’s a real concern for screenwriters. If you want to protect your idea, there are lots of ways to document that it’s yours: a) you can have your manuscript notarized (establishing a witness and a date of creation); 2) you can video yourself talking about your idea and then post it (as “private”) on a site like You Tube; 3) you can publish an excerpt of your work online or elsewhere. You get the idea. For most writers, copyright is not a big deal. In the case of book publishing, your contract will spell out all the copyright particulars and, yes, you do want to pay attention to those. Traditionally, a book contract was for the hard cover and paperback rights to the book. You’d get more money if paperback rights were included. Now, however, there is the added consideration of e-book rights. If you are negotiating a book contract, you need an agent or a lawyer. From the framers of the Constitution, who were worried about books and pamphlets, to present-day stakeholders, who are concerned about DVDs, MP3s, and the Internet, the story of copyright law is an ongoing struggle to balance copyright holders’ rights with the public interest. New technologies constantly challenge that balance. In 1790, Congress passed the first U.S. Copyright Act, which, like the Statute of Anne, gave authors an exclusive copyright for a 14-year term, with the possibility of renewal for another 14-year term. U.S. Copyright has undergone two major revisions since – in 1909 and 1976 – but has also been incrementally amended, particularly in recent years. One steady trend has been the lengthening of the copyright term from “14 + 14” to, as of 1998, “life + 70” (the life of the author plus 70 years). Copyright law has always been a balancing act between the rights of creators and the rights of the public. As each new technology emerges, and as each new revision is made to copyright law, the balance shifts. It is along this edge of copyright that innovation flourishes, often leading to additional changes in the law. For example, in 1976, Universal City Studios and the Walt Disney Company sued Sony, seeking to have the Betamax VCR impounded as a tool of piracy. In their view, there were virtually no noninfringing uses of the VCR, since home taping of television was thought to violate the copyright owner’s reproduction right. The Supreme Court in 1984 disagreed, ruling that home taping of television programs for later viewing (“time-shifting”) constituted a fair use. Two aspects of the Betamax case are important for our purposes. First, most copyright scholars at the time felt that home taping would not qualify as fair use. In particular, a court had never before found a use to be fair where (1) the copyist reproduced the entirety of a work and (2) did so for a purely consumptive, nontransformative purpose. So, had you considered the shape of the fair use doctrine in 1976, you would probably have concluded that time-shifting was not a fair use. The Supreme Court in 1984 expanded the fair use doctrine in response to the new possibilities created by the VCR. Speckled throughout the history of copyright law, the same pattern arises – wherever an activity has been deemed a fair use (and often even before, so long as a company is willing to gamble that it will be deemed a fair use), innovation flourishes as technology companies help the public to make the most of copyrighted works. Examples include the photocopier, the audio cassette deck, the CD-RW drive, and the web browser, among others. With the introduction of each new technology, copyright law is tested and evolves. This lesson should help students think about the current state of copyright’s evolution in relation to the new technologies they use in their daily lives, such as P2P, YouTube, Facebook and MySpace. 5. Bookselling Has Changed Dramatically in Recent Years! The biggest change booksellers saw before the internet era was the rise of mega-bookstores, like Barnes and Noble and Borders, and the proliferation of big box stores like Walmart and Target. The mega-bookstores were a threat because they had so much leverage — the could buy and sell at bigger discounts because they worked with larger volume. They could also influence publishers. Barnes and Noble itself is a publisher that happens to run (what is now) the largest book store chain in the country. Isn’t that a conflict of interest? Wouldn’t B&N promote its own books over others? Big box stores threatened to narrow the marketplace because they trade only in best-sellers (at deep discounts). Ironically, mega-store Borders started out as a scrappy independent in the 1970s. It grew huge in the booming 1990s, then went bankrupt in 2010. Many say it failed because it did not innovate. By contrast, its rival B&N did innovate, developing its own e-reader, the Nook. Many feel that the online retailer Amazon hammered nails into Border’s coffin. From the start, Amazon claimed that it sold books at a loss. It vastly undercuts any other bookseller’s prices. The money Amazon loses on books, it makes up for with sales of other products. Just last year, Amazon’s CEO brazenly announced that it was aiming to put other booksellers out of business by offering to undercut any discount its customers reported to Amazon. Publishers have been frequently maligned as unjustly living on the brains of authors, who are ever represented as an unfortunate and ill-used race. A knowledge of the hazardous nature of publishing, and of the heavy expenditure ordinarily incurred for making new books known, not to speak of the unreasonable expectations which are sometimes formed by literary men, would do much to dispel the common notions on the subject. For one book that is highly successful, there are numbers that become a dead stock in the warehouse, and barely pay expenses. Starting in 1990, computer technology gave rise to desktop publishing, which allowed anybody to typeset text for reproduction on an offset press. This cost-saving measure motivated many literary-minded people to start their own small presses. The advent of home office, letter-quality printers in the late 1990s further encouraged the growth of this small, indie industry. And then the development of the internet helped these indies transition to online publications and, ultimately, gave a boost to the e-book. Ultimately, this resulted in many people deciding to publish their own books. Since the 1990s, print-on-demand technology has made book selling more accessible to a broader range of authors and entrepreneurs. Print-on-demand means exactly what it says: the seller will not print the book until it is ordered. Desk-top publishing technology has made this possible, providing professional results at low cost. In recent years, book machines have entered the marketplace. The Expresso Book Machine is one example, capable of printing an entire book — cover, perfect binding, and all (from PDFs) — in a few minutes. Cost for the author is usually less than $10 per copy. But here’s the problem: even as an unprecedented number of people have access to the technology to make their own books, It is more difficult than ever to sell a book. Not only is there more competition than ever — more writers publishing in more media — but there are fewer readers and many more distractions too: the amount of time prospective readers spend playing with Facebook and other social media toys, for instance, siphons off hours that these people might have spent reading books. Vertical integration of the publishing industry has further aggravated this problem because, whereas there were once 50 or more New York publishing houses to which an author could shop her book, there are now only about 10, each with 10-15 subsidiaries. As an agent explained recently to an author when he complained that she had only shopped his book to 10 houses: “Those 10 represent everything there is.” If you can’t get through the door of the big house, then you can’t get to the 15 other smaller houses that the big one owns. The corporatization and consolidation of the New York publishing industry in the 1990s led to a proliferation of small presses elsewhere in the nation. The vast majority of writers in the U.S. are now published by small, independent publishers who have more flexibility and can take greater risks than the larger publishers. For example: because the big houses are driven by profit, they often cannot afford to retain an author if that author’s book does not sell well. 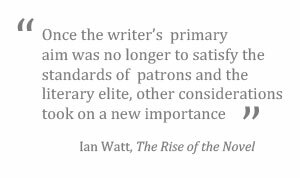 It used to be that a writer could count on the publisher’s support for 3-5 books, in the hope that the author’s work would catch on and do increasingly better. As this generosity has disappeared, many writers feel that the big houses have no loyalty and are not committed to literary quality. Small presses, on the other hand, can often afford to show loyalty because they do not pay large advances and do not have large overheads. The recent changes in publishing mirror changes in the music industry. Whereas big labels were once the be-all and end-all of a musician’s aspirations, nowadays the big labels seem to ask for too much in exchange for too little. They no longer have the funds to market and tour their bands fully and they take the lion’s share of the profits for too long. In publishing, most writers do not get a book tour, much less an advertising budget, and most get a modest advance. Then, if their book doesn’t do well within a year, it is remaindered. And then their contract isn’t renewed for another book. This is why now, many writers — including highly successful writers — are seriously considering self-publishing, which was once considered taboo. Again, the indie music scene is analogous and, in fact, the success of indie musicians may have accelerated writers’ acceptance of self-publishing. Mind you, it’s not wholly accepted — and it’s still a big gamble for most writers. You have to have a following before you can go it alone; otherwise, your book is swallowed up by the million other books on the shelves or online. The kindle book is an good example. There are hundreds of thousands of e-books selling on Amazon. How will anybody find yours unless they know who you are? It’s not clear to anybody where book publishing is going at this point. It may be that the centerpiece of selling books — the author’s book tour, first made popular by Charles Dickens – is dead. It may be that, as my last publisher said to me: “Nobody bothers looking at a book that is older than six months.” Until there is some clarity about how to sell books in this often confusing period of transition, it seems that authors and publishers will try just about anything.